Downstream Voices: Wetland Solutions to Reducing Disaster Risk. 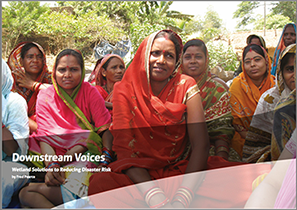 Home › Learn › Articles › Downstream Voices: Wetland Solutions to Reducing Disaster Risk. Until recently, the world’s response to inevitable climate change was based on producing ever more precise forecasts of what would happen locally – running ever more sophisticated climate models to generate data on the climate in Bamako, Mali in 2040, for instance – and then working out how to “adapt” to the change. While ever bigger super-computers with ever more sophisticated climate models still attempt that, there is a growing realisation that we will never know in any detail what is coming down the track. Some generalities emerging from the models may hold. Wet areas will generally get wetter and dry areas drier. Most of the world will be warmer most of the time. The extra energy in a warmer global climate system will tend to create more climatic extremes of all sorts – more storms of course, but also sudden cold spells, droughts even in wetter areas and worse floods even in the driest. And that means that engineered adaptation is not always a realistic option. We simply won’t know what we are adapting to. Creating engineered structures to protect people will be difficult, expensive and often either impossible or a waste of money. This new perspective suggests a different approach. Rather than an engineered response to known threats, it suggests paying much greater attention to ensuring our world is more resilient to whatever surprise a changing climate system may throw at us. Thus the new report ditches past estimates of the impact of climate change on African rainfall patterns and crop yields – a yield reduction of up to 50 percent as soon as 2020 was one spectacular claim in the previous assessment, published in 2007. This time there are no headline grabbing statistics but the more measured– and arguably more useful – statement that “climate change will amplify existing stress on water availability and agricultural systems” in Africa and will “very likely reduce cereal crop productivity”. Building resilience to climate change, therefore, needs to be part of wider systems of responding to a range of economic, social and environmental risks; one that places emphasis on natural ecosystems which grow and adapt to changing environments, rather than physical structures, which cannot. And that means that maintaining and regenerating natural ecosystems is often the most effective way of reducing the number of people and livelihoods that are in harm’s way. Meanwhile farmers can build their resilience against floods, droughts, heat waves and hurricanes, by planting more climate-tolerant seed varieties, by enhancing wetlands, floodplains and lakes, by terracing hillsides, and by opting for farming systems such as agroforestry. This report makes the case for addressing ecosystem degradation as one of the root causes of risk and vulnerability and for opting for ecosystem-based solutions as a way to reduce disaster risk and build community resilience. It focuses on water-related hazards in particular, as they make up a vast majority of risks, and are often exacerbated by inadequate water and natural resource management. Healthy ecosystems make a crucial contribution to the resilience of communities and nations. Ecosystems provide a range of benefits that help to reduce, buffer and in certain circumstances, mitigate hazards, as well as assist societies in adapting to increasing disaster risk and preventing risk accumulation. Fully- functioning ecosystems such as wetlands are also the basis of community resilience by sustaining livelihoods and providing water, construction materials and important products to local people. These services are furthermore vital to help communities recover after disaster strikes. In spite of the important contributions to resilience made by ecosystems, they are being lost and degraded at a rapid rate. Ecosystem degradation erodes nature’s ability to regulate hazards, and to provide services such as food and water. The result is that more people are caught in a vicious circle of poverty, risk and vulnerability. This drives mounting social, economic and environmental losses and imposes ever greater costs of relief and rehabilitation on governments and donor agencies. In particular, the over exploitation of water resources and the draining of wetlands exposes societies to increased disaster risk, as the ability of wetlands to moderate floods and droughts, purify water, and support water and food security is impeded. Ecosystem degradation should therefore be considered as one of the root causes of disaster risk. Investing to address underlying risk factors is more cost-effective than disaster response and recovery, and contributes to saving lives and protecting assets. Hence ecosystem-based approaches such as wetlands restoration and Integrated Water Resource Management should be at the centre of solutions to reduce disaster risk, alongside other risk reduction measures. Ecosystem-based approaches should be considered as ‘no-regret’ actions – and always a good investment –as they serve multiple purposes, including the development of sustainable livelihoods and climate change adaptation and mitigation, in addition to reduced disaster risk. While long-term changes resulting from global warming will have impacts upon ecosystems and therefore on people, most immediate ecosystem degradation stems from flawed spatial planning or inappropriate water management policies and practices and may result in ‘man-made’ hazards. It is therefore essential to understand the environmental root causes of risk in a given area and ensure sound land, water and natural resource use policies, ensuring that ecosystem services are sustained. Simultaneously, the conservation, restoration and improved management of ecosystems and natural resources should rank high in risk reduction and climate change adaption planning and strategies. It is vital to understand how areas within the wider landscape are spatially connected (upstream and downstream linkages in a river basin for example), and how interventions in one area may have (positive or negative) implications for an area elsewhere, sometimes hundreds of kilometres away. Risk reduction measures should therefore be planned at multiple spatial scales – locally at the community level, but also across wider areas (river basins, deltas), and where relevant at transboundary levels. This calls for (regional) cooperation, but also for the capacity building of local communities so that they can join forces and work together on disaster risk reduction across landscapes. The design and implementation of ecosystem-inclusive risk reduction measures requires collaboration with multiple sectors. It for instance requires collaboration with engineers and land-use planners to ensure the integration of wetlands management and restoration in large-scale infrastructural/development approaches for disaster risk reduction. It is also essential to work together with development organisations and local communities to ensure integration of ecosystem management and restoration in (small-scale) community-based risk reduction initiatives, linking environmental, humanitarian and development approaches. Ecosystem-based approaches to reduce disaster risk need to be implemented alongside other measure of risk reduction, including avoidance of high risk zones, building codes, early warning and evacuation procedures.